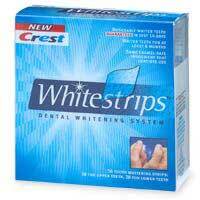 What teeth whitener is found on whitening strips? 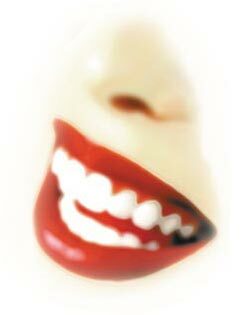 The bleaching agent used in most of the whitening strips is hydrogen peroxide, one of the bleaching agent that dentists use in the dental office to remove tooth stains. The concentration of the bleaching agent is much lower for safety reasons, ranging from 6% to 10% hydrogen peroxide (Professional tooth whitening products contain 15% to 43% peroxide, over-the-counter products, use 3% , 6% or 10%). 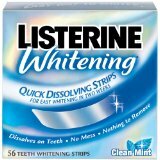 How to use teeth whitening strips? Two separate strips are provided, one for the upper and one for the lower teeth. Each whitening strip is positioned across the teeth and then gently pressed into place and let them stay there for about 30 minutes for a period of 7-14 days depending on the active ingredient’s concentration in each specific product. The 10% hydrogen peroxide whitening strips are used for 7 days whereas the 6% kits have to be used for 14 days (twice as long due to lower concentration). You must try to limit the contact of the strip with the gums to avoid irritations. How effective are teeth whitening strips? The hydrogen peroxide reacts with the stains on your teeth and release oxygen which bleaches the color out of the stains. The result is whiter teeth after about a week or two of usage. However, the results will depend on a variety of factors including how badly your teeth are stained and how consistently you use the strips. Manufacturers claim that the whitening effect will lasts from 12 to 18 months, but normally the results will last for 6 months. How long do teeth whitening strips last? Depending on your diet and types of whitening strips used, the effectiveness varies, but is generally less long-lasting than gels. An average time is 6 months to a year. Are there advantages to using whitening strips? The bleaching agent comes in less contact with the gums compared to the tray based whitening systems; therefore the possibility of gum irritation is limited. Are there disadvantages to using whitening strips? There are a lot of whitening strips in the market and is subjected to personal preference. These professional products from popular brands such as Crest, Listerine, and Rembrandt contain the same whitening ingredient as the professional products dentists use to whiten teeth. 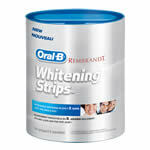 Virtually clear strips that start to work as soon as they are applied to your teeth. No messy gel and nothing to remove. Apply Crest Whitestrips Classic twice a day for 30 minute each application. These strips can be applied twice daily, for 30 minutes, for 14 days.